Welcome to Astoria Dog Owners Association’s Homepage! Thank you for visiting Astoria Dog Owners Association’s website. Astoria Dog Owners Association is a civic organization geared towards increasing services and facilities for dogs and dog owners, and advocating on their behalf. Our primary objective is to increase the quality of life for our neighborhood’s dogs and dog parents. Thus far our biggest initiative has been working towards getting a new dog run built in Astoria; a project we are proud to say is now in the works thanks to the hard work of many. Learn more about the Astoria Dog Owners Association. To learn how you can get involved with Astoria Dog Owners Association, please click here. While we now have a physical park site, Parks Department and community approval, funding, a park design, and as of November 2017 a contractor secured to build the park, there is still quite a bit of work to do. We will continue to keep the community advised as the city moves forward with the planning and design phase of the project, both here and on our Facebook page. The latest estimates (as of 1/28/2018) are that we should break ground in April 2018, and have a fully built dog run by April 2019. The status of the dog park changes frequently, so please check back frequently for the latest news. You can receive the latest updates by following our blog or our Facebook Page. Astoria Dog Owners Association is extraordinarily grateful for the support of our public officials, including Council Member Costa Constantinides, Queens Borough President Melinda Katz, and State Senator Michael Gianaris. Without their dedication to our project and generous allocation of funds, this project would not be possible. After winning $500,000 through our participatory budgeting campaign (and thanks to our Councilman), Senator Gianaris and Borough President Katz allocated an additional $500,000. To learn more about the funding efforts of our public officials, see the latest press release from the Councilman’s office. You can also read more about these updates in our blog post here. 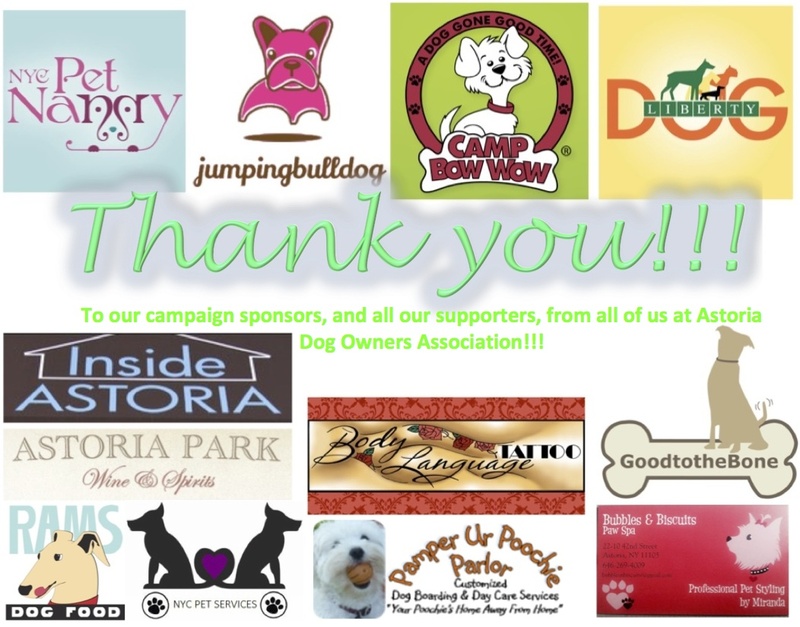 Astoria Dog Owners Association would also like to extend a heartfelt thank you to our 2015 Participatory Budgeting campaign sponsors, our supporters, and everyone who went out and voted for Proposal 13! We wouldn’t have gotten to this point without the help from all of you! Want to stay up to date on all the latest news? Like our Facebook page, and follow our blog!! Need help finding something? Visit Site Navigation. Hi, first congratulations on your new dog run! I am writing to you to ask for your help. We are the Astoria Five. We are a tree loving group that clean and maintain the beauty of Astoria trees in specific areas of Astoria. My area is Hoyt Ave. north. from 29th street to 24th street which is along the new dog run to be built. Technically, there are no homeowners responsible for this property, so we have made it our job to clean it up. We host several clean-up events each year. We were fortunate to have quite a few trees planted just few years ago along the Ave. with tree guards surrounding the tree beds, but we need plenty of help to keep them clean. They are currently surrounded by 5 feet of weeds and lots of garbage. I am planning on hosting an event within the next few weeks, so I was hoping I can count on your organization to help. I have plenty of tools and gloves provided by the Parks Dept. Councilman Costa provides the bags and arranges for the Sanitation Dept pick-up. We currently get plenty of help from the Latter Day Saints and St. John’s H.S. ( but with school out we may not get the generous help that we receive during the school year). Can we add your organization to the list? Any bit of help would be greatly appreciated. Thanks! Thank you for reaching out to us. We would be happy to announce the need for help to our committee and those who support our organization. If you could, please reach out to us with an email to mediaandmarketingadoa@gmail.com with as many details as possible? We can forward that along to recruit some people to help your organization maintain the trees in our neighborhood. We are very appreciative of the work your group does, and thank you again for reaching out to us!